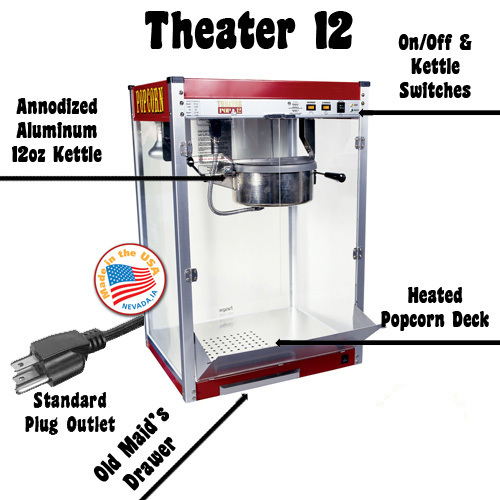 Paragon's American-made Theater Pop 12 popcorn machines are unparalleled in quality and workmanship and are comparable to commercial popcorn machines you find at the movie theaters. 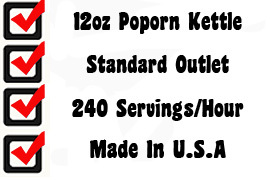 If you are looking for the highest quality popcorn machine in the market, you will find it in the Theater Pop 12. Remember, the 12oz popper works on standard, regular current. No need for special wiring! 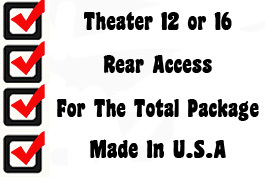 Since the Theater 12 popper will operate on a 20 amp circuit it is ideal to use in schools, or any environment that needs a mobile machine, because it doesn't require a dedicated circuit and can be plugged in almost anywhere. This allows it to be used in multiple locations and still product 221 servings per hour. As with all Paragon Poppers, the 12oz features a stainless steel food-zone, tempered glass panels, hard-coat anodized aluminum kettle and aluminum corner posts for easy cleaning.